The prequel to the Golem Crusades PC +300K downloaded game, with over 50,000 YouTube hits. "It’s an excellent, challenging game." Build and control an army of Golems to drive back an invading evil force. Liberate the land and crush the invading spawn. You will need to make decisions with lightning speed, plan your attack, build your defenses and resolve clashes between good and evil. 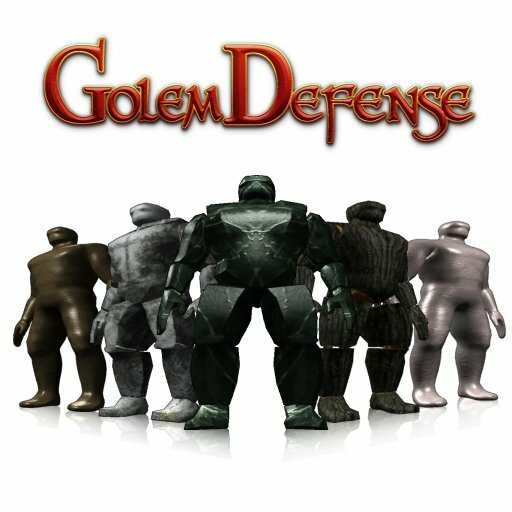 Golem Defense is a frictionless and highly accessible fantasy real time strategy game. Just using swipes of the finger you command and construct armies to attack foes and regain entrenchments. The game-play scales from a five second to tutorial to multi-headed battles lasting 15 minutes, guiding the player through each new concept one at a time. The game is a classic struggle for control of the land via the dwellings or huts on it. You must use your golems to free possessed huts, while the invading evil attempts to possess the free huts. The first to gain control of all huts wins. Also help directly by squishing marauding spiders with your finger and exorcise Golems that have been possessed by ghosts. Use the pinch gesture to zoom in to see the action, or pull out to get a full over view of the on-going battle. We suggest that the spider squelching fun of Golem Defense is best enjoyed on an iPad. Click here for full size slide show. Golem Defense is a universal application that is also playable on iPhone 3GS/4 and iTouch 3/4. Universal version for iPhone,iPad and iPod. Free to download, checkout the first level. Universal version for iPhone,iPad and iPod. All Rights Reserved. All images and content on this site are copyright 2009-2011 drop spider games pty ltd.